A resolute Cinderford came from behind to seal promotion to National One following a battling victory over Bury St Edmunds. The Foresters fought back to clinch the National Two South title after racking up 28 wins from their 29 matches played this season. While the top two is all done and dusted for another year in this division, the fight for survival is once again going to the final day of the season after another dramatic weekend. London Irish Wild Geese are nearly home and dry after a crucial win at Henley Hawks, but Barnstaple have dropped into the bottom three after their defeat to Worthing Raiders. Old Redcliffians are also still not safe as they were beaten by rivals Wimbledon meaning the Dons still have a chance to avoid the drop against all the odds. Elsewhere across National Two South, Canterbury stunned second placed Chinnor, Redingensians secured third spot, Tonbridge Juddians thrashed Taunton Titians and Redruth overcame Broadstreet. 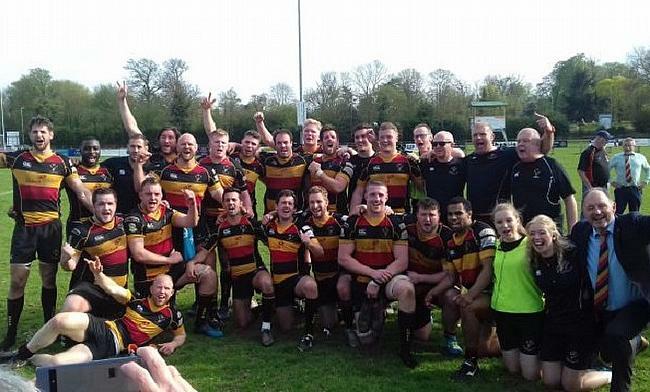 Cinderford secured the National Two South title following a hard-fought victory over Bury St Edmunds at the GK IPA Haberden. In clinching top spot, the Foresters will make a return to National One after a two year absence. A first half try from Nathan Taylor gave Cinderford the perfect start, but the scores were level at the interval as Max Kohler scooted over for Bury. The hosts looked set to spoil Cinderford’s party when Will Scholes and Liam McBride both crossed to leave the visitors trailing by14 points. However, Paul Morris’ men responded as tries from George Evans, Terence Barbarinsa and Matt Lane turned the game around as Cinderford sealed their 23rd consecutive victory and promotion to the third tier. Second placed Chinnor suffered a setback in their National Two play-off preparations as they were soundly beaten by Canterbury. Thanks to @cantrugby for your great hospitality today. Some outstanding play from your boys and a well deserved win over @ChinnorRugby 52- 29. In @Nat2RugbySouth -Well played!! Tom Rogers, who is retiring at the end of this season, twice crossed the line on his final home appearance for the City Men while Royce Cadman, Aaron Cooper, Aiden Moss (2), Ricky Mackintosh and Harry Sayers rounded off moves as Canterbury produced an excellent display. Alex Bradley, Jack Gilding, Danny Barnes and Phil Chesters (2) earned Chinnor a bonus-point which also confirmed a home play-off for Matt Williams’ side. Redingensians held their nerve to defeat Clifton and secure third place in National Two South. The Rams scored three times in the first half, one coming from Jamar Richardson, to lead 21-12 at Station Road. Clifton kept in touch with two tries of their own and after the break; both sides exchanged scores as the game stayed in the balance. Despite Richardson receiving a yellow card just after the hour, Redingensians were able to limit Clifton and a penalty from Miles Lloyd four minutes from time sealed the win for Seb Reynolds’ side. Taunton Titians suffered a heavy loss in their final home game of the season against Tonbridge Juddians. TJs started brightly with scores coming from George Lawson, Hugo Watson and Duncan Tout. Jack Claydon went over for Taunton, but Finlay Coxon-Smith, Tout, Rory McHugh and Charlie Edwards ensured the visitors had a 45-7 lead at the interval. Tom Nicoll, Watson and McHugh added more tries for Tonbridge Juddians after the break and although Connor Banks and Aron Struminski (2) both scored for the Titians, it was too little too late. Redruth have finished the National Two South season in fifth place after beating relegated Broadstreet at the Recreation Ground in Round 29. Once again, the Reds produced an excellent home performance and it was the perfect way to bid farewell to the departing Chris Fuca, Kyle Marriott and Sam Parsons. Alex Ducker was the star man with four tries for Redruth while Fuca and Lewis Vinnicombe also crossed for the hosts. Christopher Zutic, James Moreton, Chris Idhern and Harry Hudson were Broadstreet’s try scorers. Barnstaple fell into the bottom three of National Two South following a home defeat against Worthing Raiders. After opening the try scoring for the afternoon, Barnstaple trailed 15-10 at the interval with Kiba Richards crossing for Worthing. Both sides swapped two tries apiece after the break, but Worthing’s fifth score of the afternoon clinched the victory while Barnstaple now sit two points adrift of safety with a gigantic clash against rivals Wimbledon to come on the final day of the season. London Irish Wild Geese are on the cusp of securing their place in National Two South for next season after a crucial win away at Henley Hawks. Having led 12-0 after touchdowns by Zaki Chamnaoui and George Owen, the visitors were pegged back to just a five-point advantage when Will Janes dotted down. The home side went in front after half-time as Xavier Andre and Janes both touched down, but quick fire scores from Sean Cunningham and Owen put Wild Geese back in front. And further tries from Scott Moore and Alex Seers settled it for the visitors who are now five points clear of the drop zone while Henley’s wretched run of form continues. Old Redcliffians missed the chance to confirm their safety in National Two South as they were well beaten by a Wimbledon side that are still fighting for survival. Wimbledon had the bonus point in the bag before half-time thanks to scores from Ben Hough (2), Dylan Flashman, Harry Tabb and Dan Laventure. They then added three more scores after the break as Chris York, Andy Reigntes and Niall MacSweeney all crossed for the dominant Dons. Kieran Hill, Sam Smith and Jermaine Jones went over for Old Redcliffians, but this defeat for Saul Nelson’s men leaves them two points clear of the drop while Wimbledon are four points from safety heading into the final round of action.